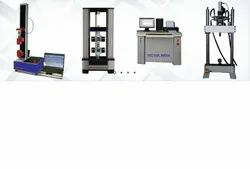 Leading Manufacturer of foam durability testing machine, electronic universal testing machine, computerized universal testing machine, digital spring testing machine, torsion testing machine and tensile testing machine from Chennai. We are engaged in manufacturing, exporting and supplying the Universal Testing Machine. The Universal Testing Machine is used for calculating the accurate measure of Tensile & Compression strength of materials by swift and simplistic approach. 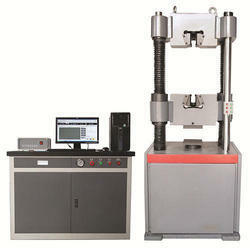 The Universal Testing Machine is easy to operate and long lasting in nature. Manufactured under the keen observation of experts, buying Universal Testing Machine from us will be the safest option for the buyers. In order to keep pace with never-ending demands of clients, our company offers Electronic Universal Testing Machine. Printer & PC graphs enable to study the behavior of the material. We bring forth highly advanced Spring Load Testing Machine in the market. 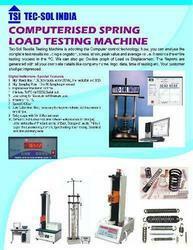 We are a prominent Manufacturer and Supplier of Spring Load Testing Machine. 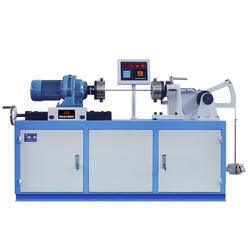 The Spring Load Testing Machine is used for measuring the load on spring. It is used in various mechanical and engineering applications. Torsion Testing Machine is designed for conducting Torsion and twist tests on various metal wires, tubes, sheet materials. Torque measurement is by Pendulam. We are a unique entity in the industry, actively committed towards providing an optimum quality range of Torsion Testing Machine. Suitable for testing a wide range of materials like Rubber. Plastic, Ferrous metals. Non-ferrous metals, etc. of various forms like round.fiat, thread. wire. dumb .11, fabric, belt, strip, rope, etc. AC servo motor for crosshead control at.. defined *Peed eft Ymm Per Minute. Over Load 11 Over travel safety. Users friendly Software, Accurate, Menu driven software. On-Line display of graph like Load. Displacement, Elongation. Test results with your company name and company logo, date and time the lest. Selectable units like N, KN, jgf, lbf, inch, mm etc. Fully automatic on-screen calculations like UTS. YS, Proof stress, etc. Electronic Extensornstar (Optional) is available for 02% proof stress evaluation. Standard Load resolution is with 1,00,000 counts. Wide range grips accessories to suit different materials & test. Various Models - Maximum Capacity from 1 k. to 100 kN. A creep-testing machine measures the creep (the tendency of a material after being subjected to high levels of stress, e.g. high temperatures, to change its form in relation to time) of an object. It is a device that measures the alteration of a material after it has been put through different forms of stress. Creep machines are important to see how much strain (load) an object can handle under pressure, so engineers and researchers are able to determine what materials to use. The device generates a creep time-dependent curve by calculating the steady rate of creep in reference to the time it takes for the material to change. Creep machines are primarily used by engineers to determine the stability of a material and its behaviour when it is put through ordinary stresses.